Phi Phi is a world-renowned spot for scuba diving lovers. Clear waters, incredible visibility, rare marine species - especially the whale shark, the biggest fish in the world. In short, on Phi Phi Don, diving clubs are numerous in the streets of Ton Sai village. It seems there is more supply than demand, especially during low season. This is an opportunity to negotiate a low price because all clubs offer more or less the same rates. You can make day dives, night dives, from the beach, on a long tail, on a bigger boat, around Phi Phi Don and Phi Phi Leh or nearby small islands, less crowded. 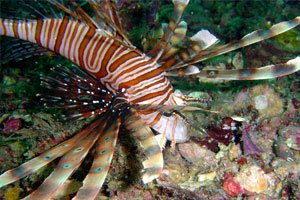 On Phi Phi, we have the opportunity to pass a PADI diving certificate at a lower cost. Theoretical and practical classes, dives and food are generally included. Again, prices are substantially identical. Prefer dive instructors who speak your language. There are so many here it will not be difficult to find.